Where better to watch the sun come up on a new year than a Caribbean beach, in the company of fellow travelers and island residents with only one thing on their minds: to welcome the day as happily and noisily as possible. Bajans welcome the New Year with parades featuring traditional junkanoo dancing and music, on islands from Grand Bahama to Abaco. Think Mardi Gras meets New Year's Eve in Times Square! The parade in Nassau is the biggest and considered the best; other parades take place on New Year's morning. 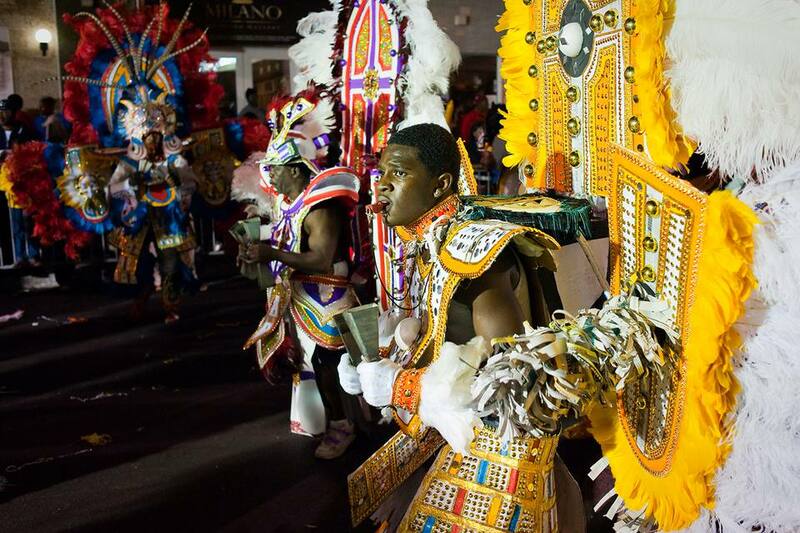 The Junkanoo parades are celebrated on both Dec. 26 and Jan. 1 and cover several blocks on Bay Street and Shirley Street in Nassau from 2:00 a.m. to 9:00 a.m. The annual, month-long Crucian Christmas Festival on St. Croix in the U.S. Virgin Islands begins the first Saturday in December and ends the first Saturday of the New Year; it features J'ouvert parties, the crowning of a Queen and King, calypso contests, parades, and a special festival village. In mid-December, folks gather along the ​Christiansted boardwalk to enjoy the annual St. Croix Boat Parade, an evening procession of watercraft of all shapes and sizes ablaze with Christmas lights. Fireworks cap off the celebration on New Year's Eve, but the party continues on for another week. The BVI is the New Year's Eve capital of the Caribbean. This famous boating destination marks the new year with impromptu New Year's "boat-hopping" parties and stops at the many beach bars that dot the islands, such as the Bitter End Yacht Club. Various restaurants and bars hold "Old Year's" celebrations on New Year's Eve, with partying till dawn a part of the tradition. The original and most famous is held at Foxy's Bar and Restaurant on Jost Van Dyke—a 48-hour-long party with live music, dancing, dining, and imbibing. The Trellis Bay New Year's Eve Festival starts at noon on New Year's Eve and features fireworks, reggae, and boat-hopping in a family-friendly atmosphere. Each New Year's Eve residents and visitors alike flock to Philipsburg -- the capital of St. Maarten -- to view a massive fireworks display over Great Bay. Get there early to claim a spot on the boardwalk, a.k.a. The Great Bay Beach Promenade. The fireworks start at midnight, but allow time to stroll the streets of the town first, grab some festive swag, duff a cold Heineken, and indulge in some of the great restaurants before the show begins! Most Carnival celebrations focus on Easter, but the St. Kitts National Carnival kicks off the day after Christmas—known as Boxing Day in many parts of the world—with a traditional J'ouvert party and runs through New Year's Day. The Kittsian carnival celebrates local folklore and traditions through song, dance, drama, and poetry, and like other Caribbean carnivals, there are street parties, performances, and musical competitions. If you're the kind of person who always wants to be first, join the throngs at Point Udall, St. Croix—the Easternmost point in the United States—to greet the arrival of the New Year at midnight on Jan. 31 (a sundial marks the spot). Pack your party favors and a bottle of local Cruzan rum and join the local festivities, which typically last until dawn's first light over the Caribbean. A Happy New Year, indeed!